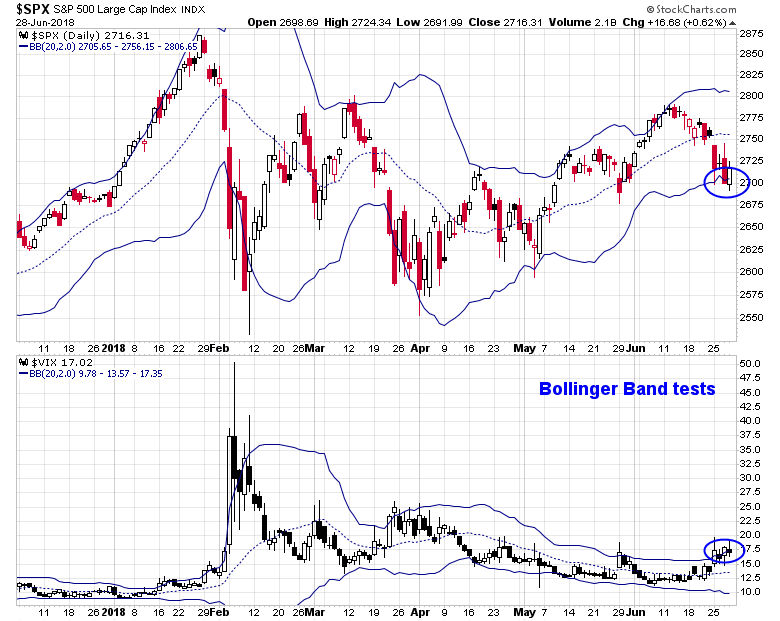 Now that the SPX flirted with the combination of the 2700 level and its lower Bollinger Band (BB), it's time to see if the market is ready to bottom on a short-term and intermediate basis. Let`s analyze outlook from the perspective of breadth, momentum, and sentiment. Mid-week market update: In light of the recent market turmoil, I thought I would publish my mid-week market update early. The Shanghai Index moved into bear market territory by declining 20% on a peak-to-trough basis overnight. The SPX is testing its 50 day moving average (dma). Europe is struggling as both the FTSE 100 and Euro STOXX 50 have violated near-term support levels. Is this a warning that the bull is dying? I have some good news and bad news. The good news is the bull market is still alive. The SPX is undergoing a correction, but it remains in an uptrend within a range-bound consolidation that began in February. The bad news is traders need to expect more short-term pain. An odd paradox in defining this moment in politics: The more President Trump does, says and tweets outrageous things, the more his critics go bananas and the better he does in the polls. 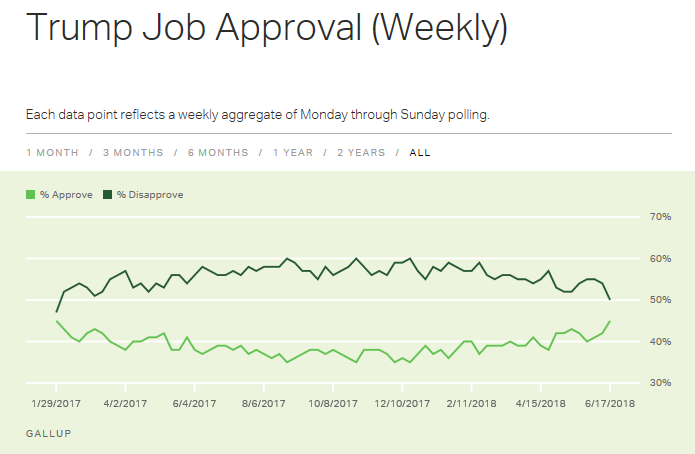 Indeed, Gallup's tracking poll of presidential approval has been steadily rising for much of this year. 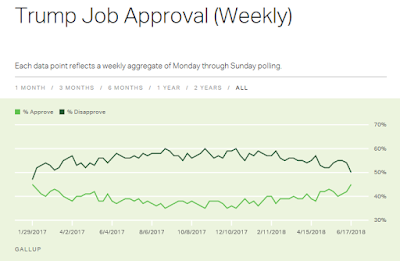 CNBC also reported that a majority of Americans approve of Trump's handling of the economy for the first time. The rise in Trump’s numbers, and the shrinking Democratic advantage in House races, are reinforcing Trump’s worship of his own instincts on policy. Except many of these choices may make his reelection even more dependent on his worshipful base, and less appealing to swing voters. It’s a circular political strategy that relies on ignoring independent voters, and assuming they won’t turn out. It creates a narrow, treacherous path to reelection. Call it a short-term gain for medium term pain electoral approach that creates significant market risk. A minor scuffle erupted in the blogosphere last week. Fed watcher Tim Duy took issue with David Rosenberg's recession call with an article entitled "No, A Recession Is Not Likely In The Next Twelve Months. Why Do You Ask?". While Duy acknowledged that Fed policy is likely to be the trigger for the next recession, he disputed Rosenberg's contention that a recession is about to begin. As far as the Fed is concerned, I don’t think we are seeing evidence that policy is too tight. The flattening yield curve indicates policy is getting tighter, to be sure. But as far as recession calls are concerned, it’s inversion or nothing. And even inversion alone will not definitively do the trick. 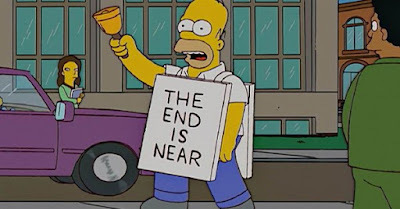 I think that if the Fed continues to hike rates or sends strong signals of future rate hikes after the yield curve inverts, then you go on recession watch. With inflation still tame, however, the Fed may very well flatten the yield curve with two more hikes and then take a step back. To be sure, it will be hard to stand down or even reverse course on the yield curve alone. After all, the yield curve is a long leading indicator. It will be the outlying data. But there is a reasonable chance the Fed will not tempt fate in the absence of a very real inflationary threat. Who is right? Tim Duy or David Rosenberg? In the past, every recession has been accompanied by a bear market. This is one in an occasional series of articles highlighting the hidden investing factor exposures, starting with small cap stocks. Small caps have been on an absolute tear lately, both on an absolute basis and relative to large caps. 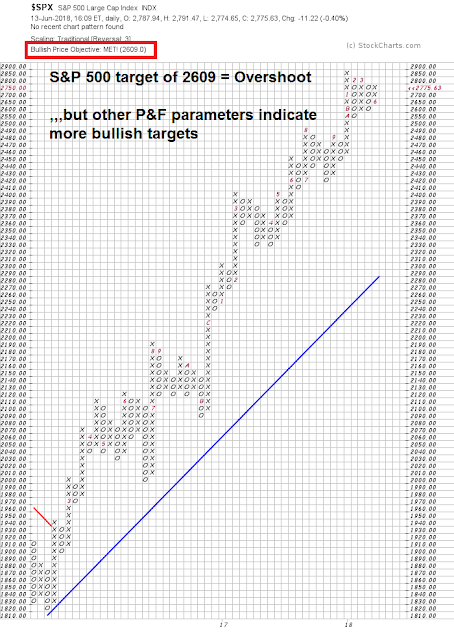 Does that mean you should jump on the small cap momentum train? Is the trade war correction over? Mid-week market update: The fate of this market is becoming highly news dependent. Ed Yardeni recently stated in on CNBC that he has never seen a "president this bullish and bearish at the same time". The market wants to go up on earnings, but it has been held back by Trump`s protectionism. Will stock prices rise or fall? Is the trade war correction over? Unfortunately, my time machine is in the shop getting fixed. However, we can rely on technical and sentiment analysis to give us some clues. First and most encouraging was the market price action overnight. The Shanghai market stabilized and showed a minor gain after the horrendous drop Tuesday. 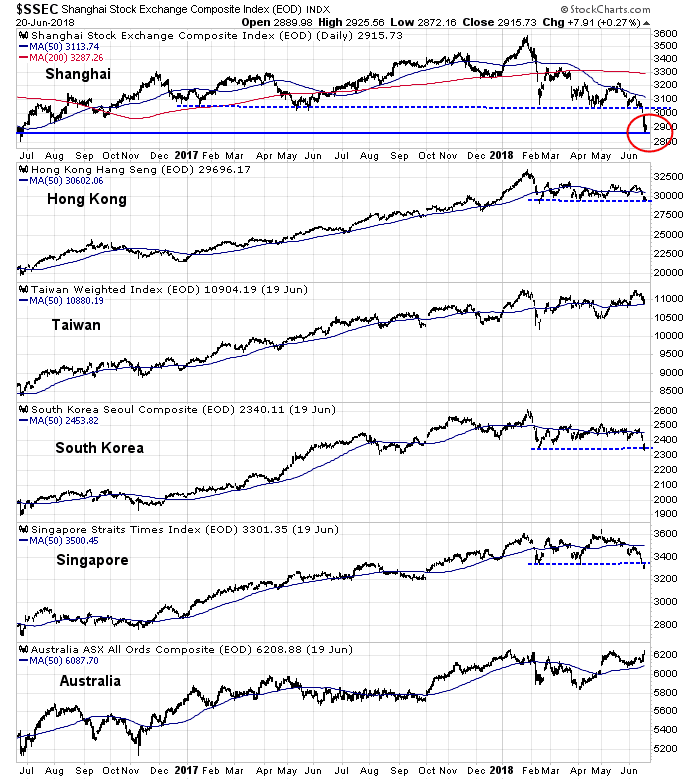 The stock markets of China's major Asian trading partners also showed signs of recovery, and the markets in Hong Kong, South Korea, and Singapore successfully tested key support levels. In addition, I had highlighted a technical pattern on June 10, 2018 (see Can America still lead the world?) indicating that the market had broken down out of a series of bearish wedges. 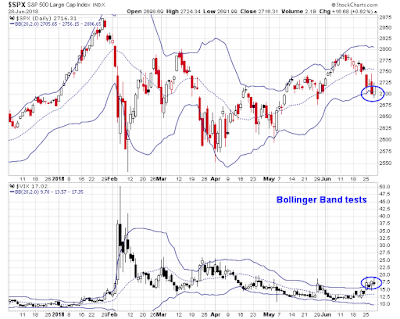 Each breakdown was accompanied by either the VIX breaching or touching its lower Bollinger Band. Subsequent corrections have lasted roughly two weeks, and each pullback have been increasingly shallow, which is intermediate term bullish. If history is any guide, and notwithstanding more trade war jitters, the market's weakness should end this week. 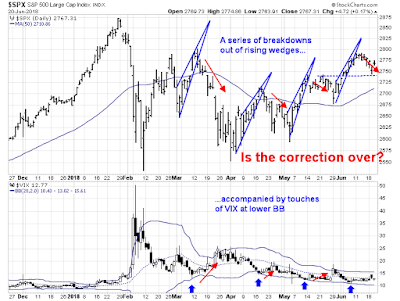 Tactically, it is less clear whether we have seen the actual bottom of this correction just yet. 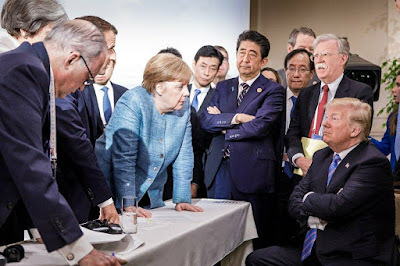 What Trump never told you about the price of a trade war "win"
War is hell, even trade wars. The world is again at risk of lurching into a global trade war. Last Friday, Trump announced the imposition of 25% tariffs on $34 billion in Chinese exports, with another proposed list totaling $16 billion that is subject to public comment and review. China has responded with retaliatory tariffs on $34 billion in American exports, mostly in agricultural commodities and automobiles. Under these circumstances, it is useful to revisit my analysis written in January of the possible fallout under such a scenario (see Could a Trump trade war spark a bear market?). I had highlighted analysis from the Peterson Institute in 2016 modeling the effects of a full blown and abortive trade war on the US economy. The economy would lapse into a mild recession in the former case, but sidestep a recession in the latter case. However, the results did appear anomalous as I pointed that that the observation of (then) New York Fed President Bill Dudley that the economy fell into recession whenever unemployment rose 0.3% to 0.4%, as it would in the modeled result of the abortive trade war. President Donald Trump tweeted in the past that "trade wars are good, and easy to win". What if he is right, and trade partners either backed down from retaliatory tariffs, or only imposed limited tariffs? How would "winning" a trade war look like? Let's put on our rose colored glasses and take a look. The last time I published a post in a series of "things you don't see at market bottoms" based on US based investor enthusiasm was in January. That's because market exuberance had significantly moderated since the January top. Guess, what, the giddiness is baack! 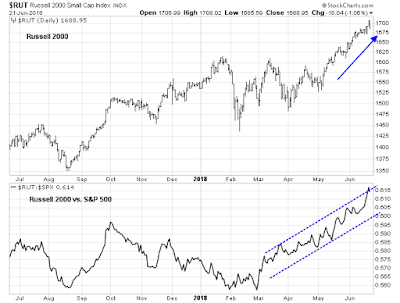 Mid-week market update: Since early May, it has been evident that the bulls have regained control of the tape (see The bulls are back in town). Not much can faze this market. Even today's hawkish Fed rate hike left the market down only -0.4% on the day. The question for investors then becomes how far this rally can go. From a technical perspective, the answer was surprising. Applying point and figure chart on the SPX yielded a target of 2609 using the parameters of daily prices, and the traditional box size and 3 box reversal. Extending the time horizon to weekly prices, the target was 2549, and monthly prices, 2579. This analysis implies that the market has overshot its target. But varying the parameters using a % box size told a different, and more bullish, story. The question takes on a different context from an equity investor's viewpoint. 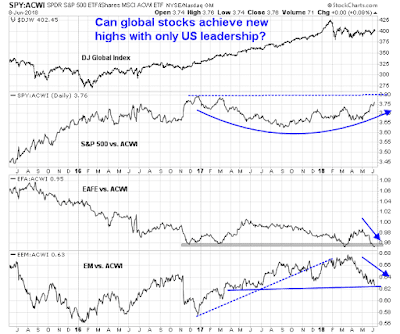 The chart below shows that US stocks have been the only source of market leadership, which begs the question, "Can global stocks achieve new highs with only US stocks?" 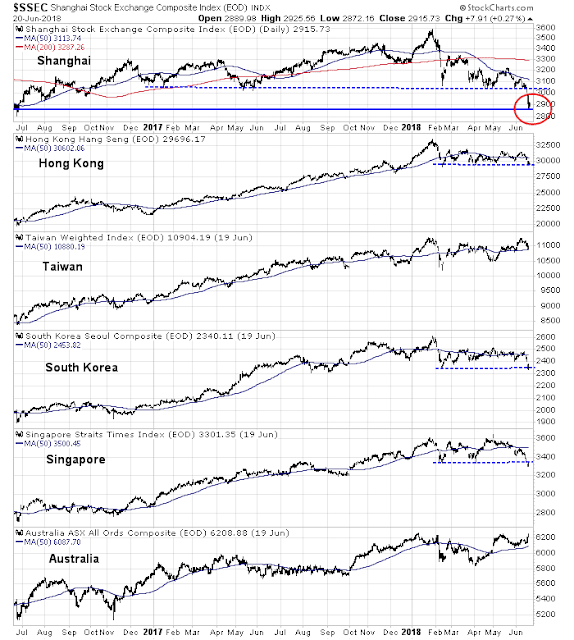 The chart below compares US, international developed markets (EAFE), and emerging market (EM) equities to the MSCI All-Country World Index (ACWI). 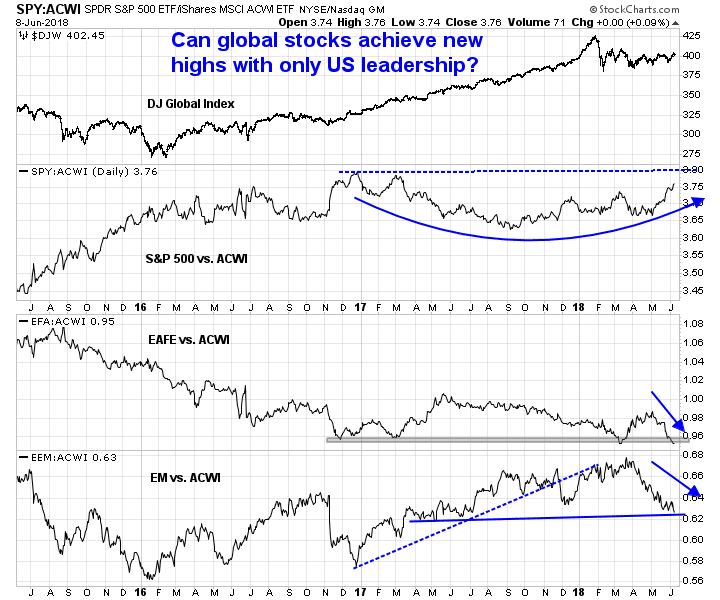 US equities have been tracing out a saucer shaped base on a relative basis. EAFE have been weak in the past year, and they are testing a key relative support level. EM relative performance began to falter in late 2017, and relative strength has been rolling over. I probably forgot a few, but you get the idea. 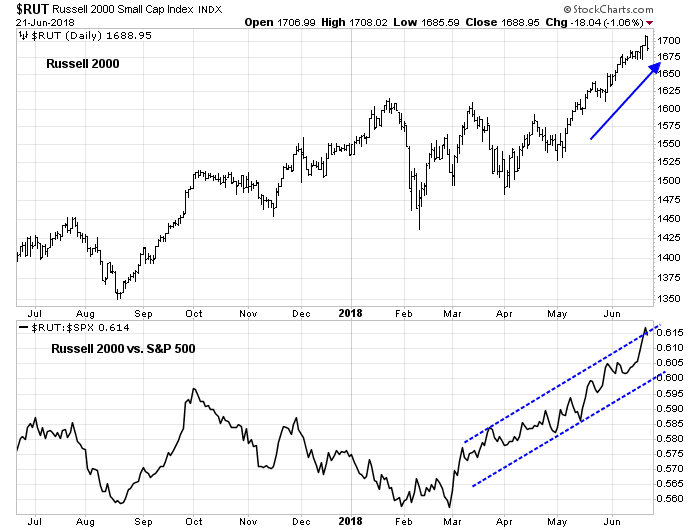 In addition, the metrics of risk appetite, such as the ratio of high beta to low volatility stocks, is exhibiting a positive divergence. Hold the celebrations! While I have been bullish throughout this corrective episode, I am very aware that the bulls still have some short-term challenges to overcome. Do you really want to be a contrarian investor? Most of the time, being contrarian means that your investment views are far from the crowd, and you will feel very isolated and uncomfortable. With that preface in mind, I offer two uncomfortable contrarian trades, based purely on technical analysis. Let's start with the latest developments in Trump's trade policy of imposing aluminum and steel tariffs on major allies. Canada's prime minister Justin Trudeau responded in a Meet the Press interview by characterizing the tariffs, which were imposed on national security grounds, as "frankly insulting". The idea that the Canadian steel that’s in military, military vehicles in the United States, the Canadian aluminum that makes your, your fighter jets is somehow now a threat? Our soldiers who had fought and died together on the beaches of World War II... and the mountains of Afghanistan, and have stood shoulder to shoulder in some of the most difficult places in the world, that are always there for each other, somehow — this is insulting to them. The reaction isn't just restricted to Canada. The latest G7 communique of finance ministers and central bankers was, well, more like a communique from the G6 plus one. Trump hit back with this latest tweet. How would you feel about fading trade fears, starting with the fears of a NAFTA breakdown? Market timers have a dirty little secret that they won`t tell you, "Bottoms are easy to call, but tops are hard." Consider the use of the NAAIM exposure index just as a typical example of a contrarian indicator. 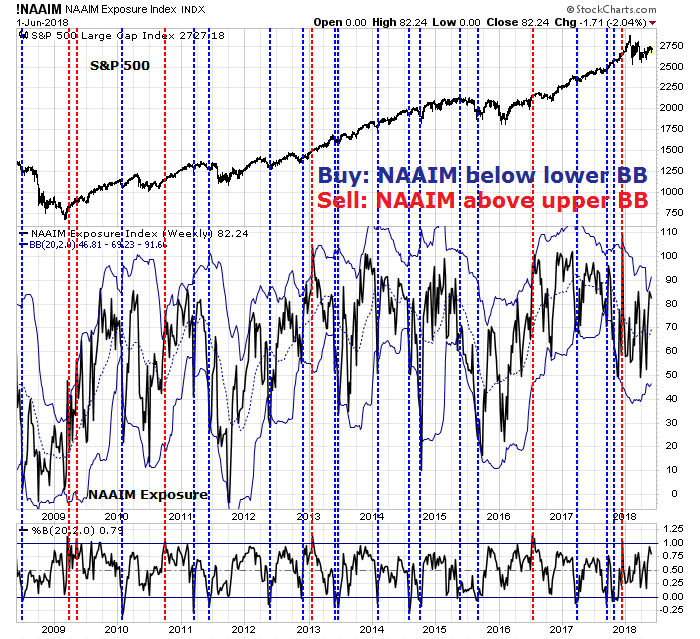 In the last 10 years, episodes when the NAAIM fell below its Bollinger Band (blue vertical line) have been good trading buy signals. While oversold markets can become more oversold, buy signals have marked periods of low downside risk. 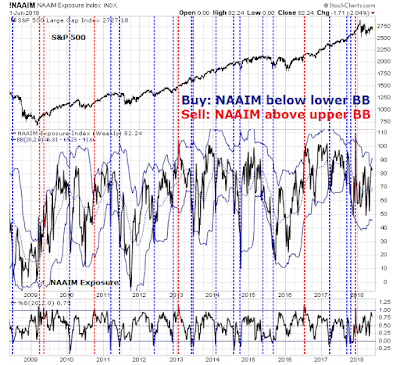 On the other hand, sell signals when NAAIM rose above its upper BB have not worked well. Who needs a market timer during conditions like those? One leading stock-market timer I monitor told me that during the market’s blow-off stage between last November and the late-January peak, he lost 18% of his subscribers. He added that he’d never before experienced a drop in subscribers of similar magnitude — much less over so short a period. Glenn Neely, editor of the NeoWave market-timing service, said 2016 and 2017 were some of the most difficult he’s experienced in a 30-year career. As the Wall Street adage goes, "Bottoms are events, while tops are processes." 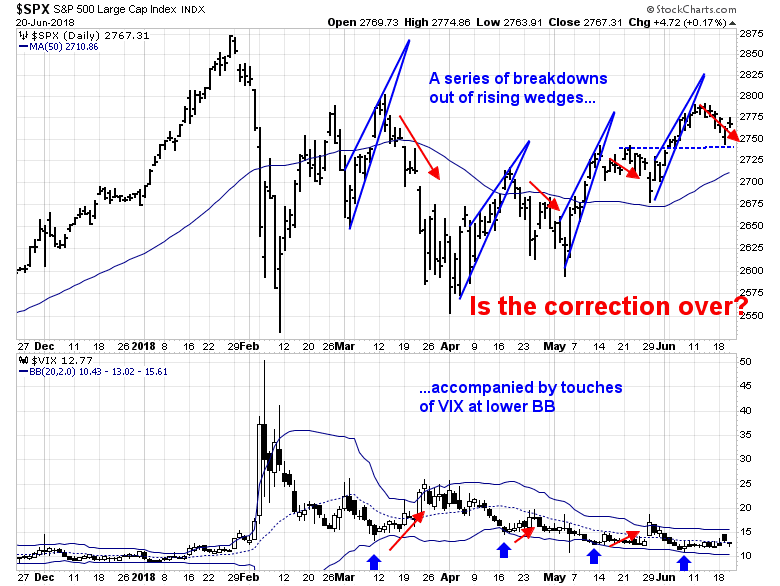 Ignore "this will not end well" warnings with no obvious bearish trigger. Don't be fooled by the clickbait stories of doom.